Today’s blog post was written by Liz Loughran, Graduate Career Consultant for the College of Science. Liz also has her Ph.D. from Notre Dame, and provides her perspectives below. Why engage in personal & professional development (PD)? There are multiple ways to consider this question. From a holistic perspective, engaging in PD can lead to a happier, healthier, more fulfilling graduate education. A more pragmatic perspective is that fantastic research and publications alone may not be enough to land you a job or career you want in a dynamic economy after graduating. Not only does PD lead to a well-rounded graduate education and a smoother transition to your first destination post graduation, it provides the opportunity to develop skills, perspectives and relationships you will carry past graduate school into the rest of your life. In this post, I share about two of my PD experiences from my Ph.D. at Notre Dame and give a few tips for engaging in PD as a graduate student. Crucibles. Over the course of the year, each fellow shared a reflection on a crucible, or a challenging moment or experience that allows a person to grow through reflection on values, motives, assumptions and judgments made. Crucibles are often pivotal moments in the life of a leader. This practice of sharing crucibles helped me adapt a framework with which to understand and make use of difficult events or experiences in my life. I became quicker to recognize that difficult situations can help me grow. I now have more hope that difficult situations will produce something new. Career Uncertainty. EL-STEM provided a forum for conversation with peers and speakers about the uncertainty involved in career discernment. More often than not, the road to our goals is circuitous. Learning to expect the unexpected, accept uncertainties and to stop worrying has been really valuable to me. I wanted to enhance my ability to communicate my research to a general audience. I used some of the content and my slide (which I spent a lot of time on!) in my defense introduction. It was a great way to engage my audience, many of whom were not scientists, right off the bat. If you are a finalist, you will have a published link of yourself presenting that you can share during a job search. Even if you don’t make it to the finals, you’ll have a recording of your first round presentation that you can share. Both in high school drama productions and graduate school presentations, I always got the jitters for the first 5 minutes of presenting. After that, I calmed down and enjoyed presenting. 3MT was a unique challenge for me because it’s only 3 minutes! There’s no time to settle into presentation mode. I knew I wanted to learn to manage adrenaline and nerves at the beginning of presentations more effectively, and practice makes perfect. 3MT is fun. It affords a chance to meet other grad students from diverse fields and do something challenging together. Think of professional development as part of your graduate education. During my dissertation work, I had a piece of copy paper with a green outline of a shamrock. In each of the 3 leaves was written Research, Writing, Professional Development. This served as a visual reminder to engage in PD and “gave me permission” to take the time to engage in activities other than my research. Connect with other graduate students, including from other disciplines. Graduate school can feel isolating at times, with large amounts of time spent in your library carrel or laboratory. Know you are not alone! There are many people eager to connect with you. Gradlife events are great way to connect with others, as are professional development opportunities through the graduate school, departmental clubs and associations like AWIS and SWE. Pick 1-3 personal/professional development items each month. Keep an eye on the professional development webpage of the Graduate School and come meet with your Graduate Career Consultant. The unexamined life is not worth living. Carve out time to engage in self-reflection. In June, Erik Simon wrote a blog post stressing the importance of reflecting on and understanding ourselves. Reflections on our values, skills and interests and how they intersect is an important piece to your career development. 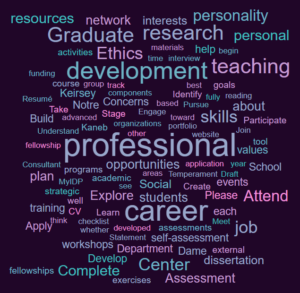 Engage in assessments on gradcareers.nd.edu as well as through myIDP (STEM) and ImaginePhD (Humanities). Apply for Grants and funding early and often. Applying for funding is critical whether or not you plan to stay in academia or pursue a career outside academia. Go out to lunch with faculty candidates, attend their job talks and participate in student-led interviews within your department. Apply for a Common Good Initiative (GGI) seminar with the Center for Social Concerns and reflect on how your discipline can benefit the common good. I participated in CGI Haiti 2015 and it was a profound experience. What are ways you engage in PD and how do you think about PD in the context of graduate education? Please share your ideas and experiences in the comments section below.